It is chilly and good reading weather here, so I often enjoy curling up with Momma to read a good book featuring dachshunds. 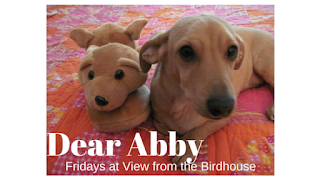 I thought you might enjoy a peek at this book from my little dachshund books shelf here. 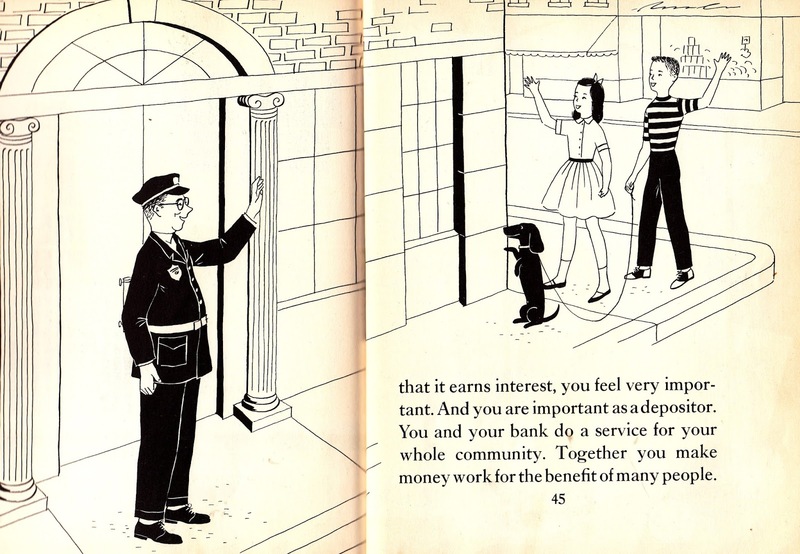 It's a vintage book called Let's Go to a Bank. 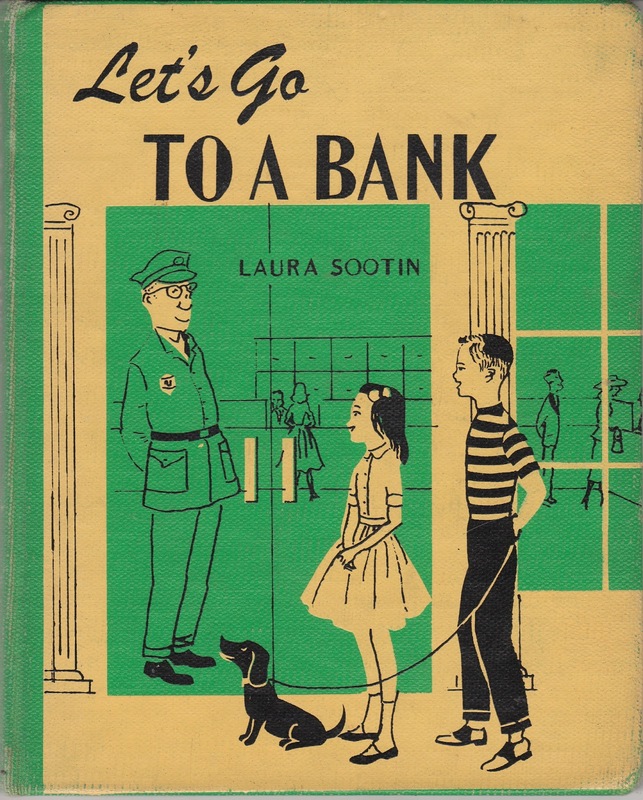 This book was written in 1957 by Laura Sootin, with illustrations by Barbara Corrigan. 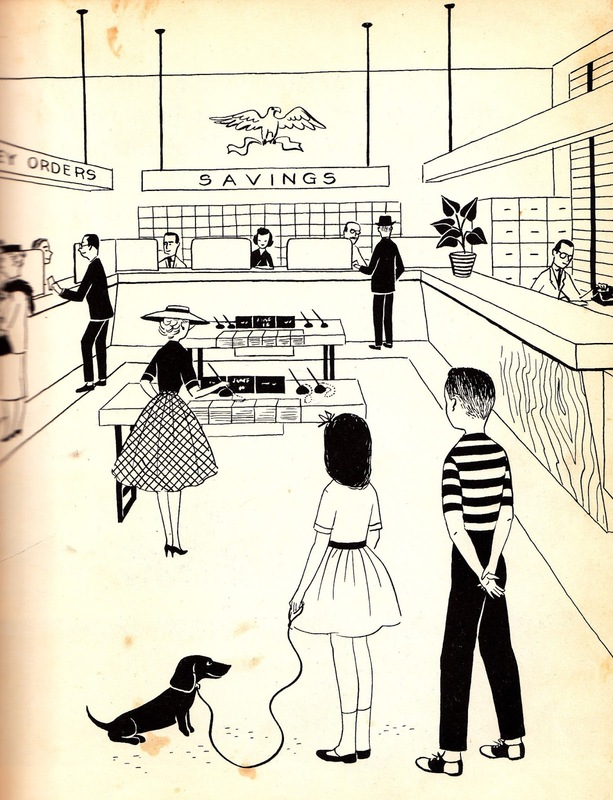 It is a nonfiction book for children with pictures about how a bank worked in the 1950's. This may not sound fascinating yet, but let me tell you ... the boy and girl in this book take their dog to the bank with them. As you can see from the cover of the book, the dachshund is welcome at the bank. 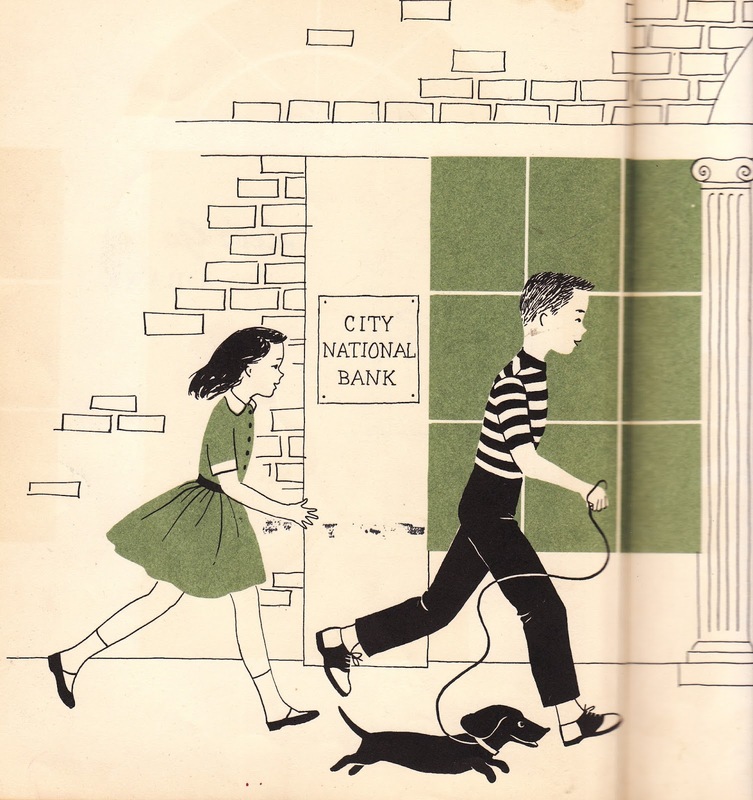 The children walk down the sidewalk with their dachshund, eager to go to the bank. I am pretty sure that doxie wants to withdraw extra money for treats and toys. Here the dachshund - and her children - survey the old fashioned bank. I like this picture. 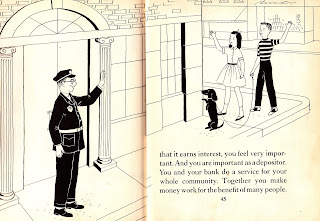 As the children talk to a banker at a long desk, the dachshund reaches up to see what is happening. As they leave the bank, a friendly security officer waves "goodbye." The dachshund stands up so politely. 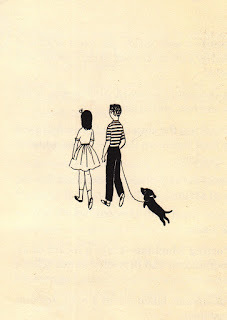 And here is a sweet picture of the children and their doxie pal walking home. 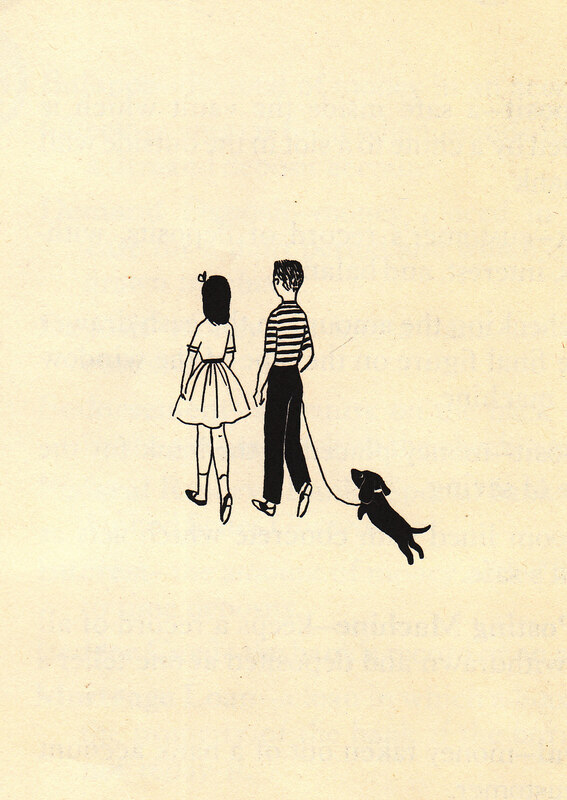 I hope you enjoyed this glimpse of a vintage book featuring a cute dachshund. I had fun reading it again this week. I love vintage books! For my baby shower, my grandmother gave me a few books from her childhood and it was so special! So cute. What a great perspective! Darling pix!! thanks so much!! 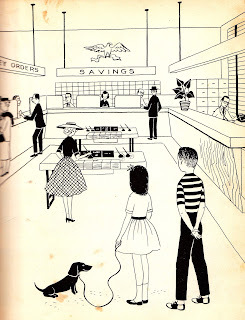 Another great post with a vintage dachshund book. Thanks for sharing, Abby. The simplicity of the story makes me long for years gone by. I find myself walking my own dachshund through the story. Well, in my thoughts that is. There is something very captivating about these vintage story books. Thank you for stopping by! I enjoyed hearing from you. Barbara, my Momma says the same thing about these old fashioned books ... they make her happy and nostalgic.